This particular recipe, using cranberries, does remind me of Christmas slightly, but quite frankly is great any time during the winter. Despite being the end of February, it’s still very frosty here in the UK and although the parsnip is starting to go out of season now, it’s a great excuse to use up this winter veg. This is also an easy way to use up any leftover maple syrup you may have from pancakes on Shrove Tuesday. Our recipe for maple, sage and cranberry roast parsnips takes just a couple of minutes to prepare and then can be left to cook away with the briefest of checks midway through. For this recipe, although there are quantities below, it is all about ratios. We’ve found you can never make too many roast parsnips, so it should be easy to multiply up the quantities, although adding only 10g of cranberries for each additional parsnip required. 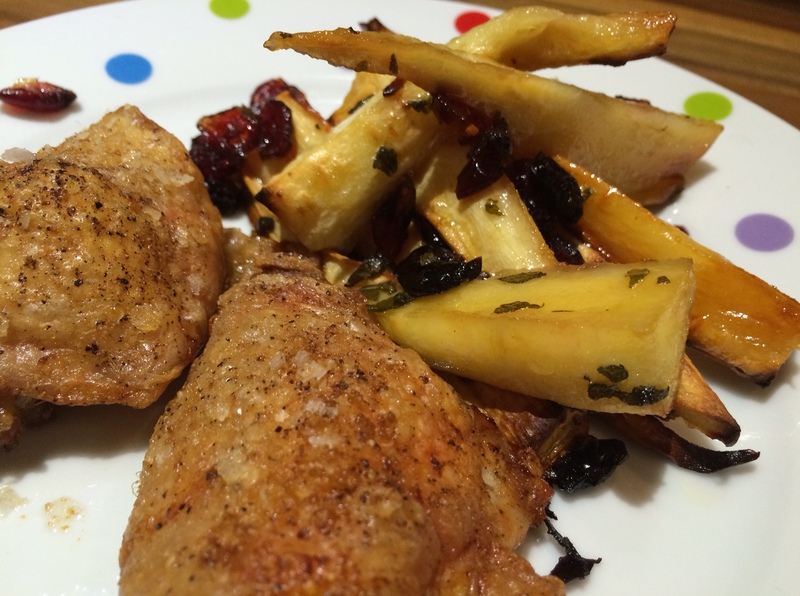 We’ve served a very simple dinner, using our parsnips as the accompaniment to roasted chicken thighs (skin on), although they are delicious with turkey or cold meats. We drizzled the chicken thighs with a little olive oil and good sprinkling of sea salt and pepper, putting them in the oven about 10 minutes after the parsnips so that everything was ready at once. 2 large parsnips – peeled, topped, tailed and cut into sixths lengthways. 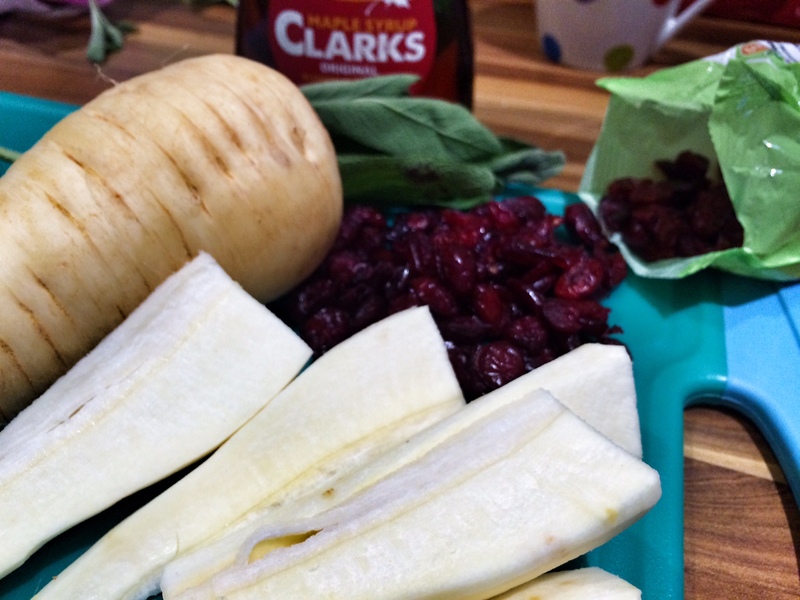 Pre-heat the oven to 180ºC, then peel and chop the parsnips. In a small bowl mix the olive oil, maple syrup, chopped sage and dried cranberries with a pinch of sea salt – something to balance the sweetness of the maple syrup. 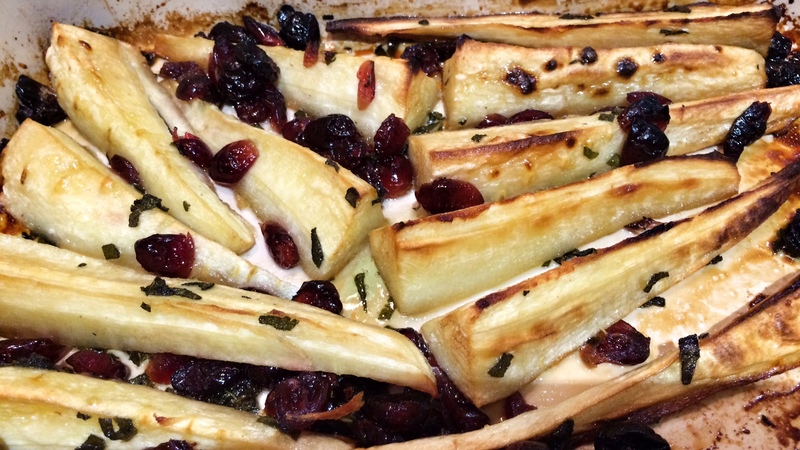 Tip the parsnips into a suitable sized roasting tray, such that there’s still a bit of space between each one, then drizzle the cranberry and sage syrup all over the parsnips. Toss around so that each parsnips piece is glazed – we found it easier to do this by hand, but use whatever implement you please. Cover with tin foil and bake in the oven for 30 minutes. Then remove the tin foil, turn the oven up to 200ºC and cook for a further 20 minutes.